One man. A world of food. Still learning how to use this site, post recipes, etc... Bare with me!!! Fabio Bongianni was born in Rome in 1961. He attended school to become a lawyer but realized his true passion was cooking. Fabio then pursued his dream even further by taking a cooking course in Paris at Ritz Escoffier cooking school. After graduating he came back to Rome and he created and managed the most successful American steak houses in Rome, the T-Bone Station. In 2004 he opened That’s Amore restaurant in the center of Rome close to the historic Trevi fountain. He then decided to transform his property in the countryside of Mazzano Romano into a cooking school . 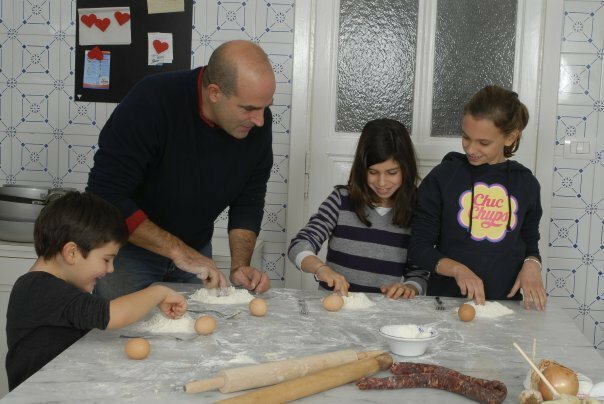 His school has had great success for many reasons: the way he teaches Italian cuisine - not only recipes but the special culinary secrets and also the quality of the day spent with Fabio contributes to his success. You will feel like a friend, not just a tourist. Presently the cooking school is promoted by many tour operators in USA as well as in Europe. Thanks for following me.Give my kind regards to every one at home. Thanks for following me. I am new to this, I look forward to looking at some of your recipes as well! Interesting story! I work in a travel agency in Canada and we are looking for culinary tours. I would be interested in learning more about your cooking school. Hi Fabio I work in a travel agency in Canada and we are looking for culinary tours. I would be interested in learning more about your cooking school. Ciao Fabio....I very much enjoyed your lasagne with eggplant and appreciate the step by step instructions. It was a joy to put this dish together and then enjoy it with family. Thank you. Ciao, Fabio! Thank you very much for following me ! :) .... It would be very interesting and big pleasure to look your great recipes and your professional recommendations.... My best regards! Ciao Fabio...love all Italian cooking!! ciao fabio grazie tante a gentleman as yourself and the love for italian food is a pleasure to meet you (piacere), i travelled to Rome with my gorgeous italian man and we walked rome by foot in summer getting lost and enjoying the ambiance. Fontana di trevi is a busy spot i must say, but as majestic as they say. I wanted to invite you to take this short poll about my new online cooking magazine that I am thinking of starting. I just want your opinion and was wondering if you could take a minute to take the short survey (only 7 questions). Hi Fabio, thanks so much for following me. Can't wait to see what wonderful recipes you have in store for us! Thanks for adding me! Your blog looks great and I am looking to getting into teaching classes as well so will look to learn from you! Thanks for the add & I'm also following u now! Do chk out my recipes :) Looking fwd to sharing! Looking forward to cooking some of your delicious recipes. Thanks. Thank you for following me. Too fun. I was JUST thinking of taking a cooking class or two when I'm in Rome next May...hmmm...I'll keep you in mind! I would be honored to have you! Haven't been on here much but plan to start in September after my new website is completed! Thanks friends!! Hello,thank you for the follow ! Hi Fabio,thanks for the follow! Hello Fabio, It's my pleasure to have you around... Thanks and regards!! !